France abounds with metal bands of many genres. Thanks to Epiphora and Pervade Productions, Dangerdog has been able to get some sense of the French metal scene. 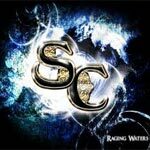 The most recent offering, released in 2010, is Raging Waters from Syrens Call, a symphonic power metal band with a female lead vocalist from Lille, Nord-Pas-de-Calais. Syrens Call started in 1997, and Raging Waters is their third full-length work since 2000. With a female lead, comparisons to similar bands in the genre are obvious, but let's let that pass for the moment. Venturing into Raging Waters , I was taken aback by the first track, Hang on to Life, which sounded like power 'dance' metal thanks to the rhythmic pulsing beat. This stuff belongs in a Paris discotheque, I thought. There's similar qualities in other songs (like Perfidious Paradise), but not quite as persuasive. I was ready to abandon Raging Waters completely. However, Syrens Call redeems themselves as you travel along this musical road. Things improve beginning with Ashes of Destiny, a quite intense and entertaining piece of melodic power metal. Cruel Love and Never Come Back Home are persuasive things to their clever arrangements. Some songs like Desecrated Past begin as traditional goth-style pieces, but then erupt into pure melodic classic and power metal. Here lead guitarist Thibaut Coisne offers rich fret work in that neo-classical tradition. Less bombastic is One Bloody Kiss, which offers heaviness tempered by Frank Manier's keyboards. Syrens Call offers an interesting instrumental that gets a bit redundant at the end. The magnum opus here is the final track, The Dance of the Light, which shows the strength of the band in composition and musicianship. However, what it best demonstrates is how heavy metal, from the very early on, has drawn from classical music for inspiration. Syrens Call incorporates the melody of German baroque composer Johann Pachelbel's (1653-1706) Canon (most often done in D Major) with outstanding results. This nearly negates that 'dance' beat I heard early on. Finally, returning to the comparisons to other female fronted bands, like Epica, Nightwish, or Visions of Atlantis, Soraya Hostens and Syrens Call hold their own; they neither sound the same nor necessarily borrow from their peers. However, sometimes I think Ms. Hostens is submerged by the music, not always getting here place in the forefront. Bottom line: Syrens Call's Raging Waters was an unexpected pleasure. This is fine symphonic power metal, filled with melody and emotion, and some certain progressive nuances. Recommended for your enjoyment. Syrens Call's Raging Waters was an unexpected pleasure. This is fine symphonic power metal, filled with melody and emotion, and some certain progressive nuances.